"Blue is considered to be a colour of danger for wild animals as it is rarely seen in nature. When a car approaches with a low beam of light, this light is reflected back along the roadside creating a kind of light fence. It is hoped that this will discourage wild animals from crossing the road. 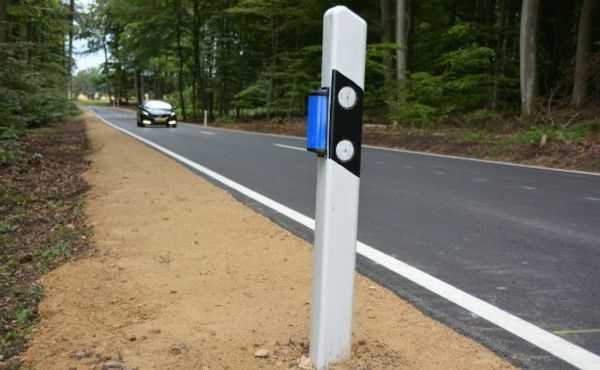 Reflectors have already been installed at intervals on roads between Weyer and Fischbach and Godbringen and Heffingen. More are expected to follow in areas where deer are known to cross roads, in the south, north and along the Moselle." Similar blue reflectors have been tested in Germany with great results - resulting in a 73% reduction of night-time accidents with wild animals.